In the centre of Marlborough, just behind Waitrose (Hillier’s Yard Car Park) is a stretch of the River Kennet that was lacking in the habitat normally found along a thriving chalk stream. The practical restoration of the riverbank began in November 2015 and was completed in December 2015. Our team of volunteers made up of members of the community, including students from St John’s Academy worked together to reduce further erosion of the riverbank creating a more natural sinuous river corridor planted up with attractive and beneficial native marginal plants associated with a healthy chalk stream. Over time this stretch will become a suitable habitat for many species of wildlife, already plants provide shelter, food and nesting sites. Britain’s fastest declining mammal, the Watervole was already living close-by. Evidence of it’s presence has now been recorded at this stretch. 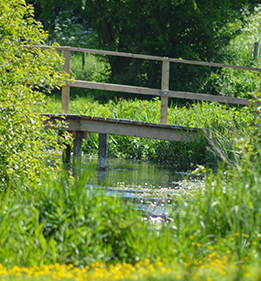 The project is funded by Aster Communities and Thames Water Rivers & Wetlands Community Days. The project is supported by Waitrose (who own the riverbank), the Environment Agency and the Wild Trout Trust.